These leading companies have taken a hit but still have the growth potential to juice your long-term returns. More often than not, leading companies in their industries find ways to win over their competitors in the long run. That doesn't mean top stocks never stumble. But when the market loses focus of the big picture over a short-term issue and discounts the shares of a top-performing company, investors can swoop in and lay the foundation for superior returns over the long term. 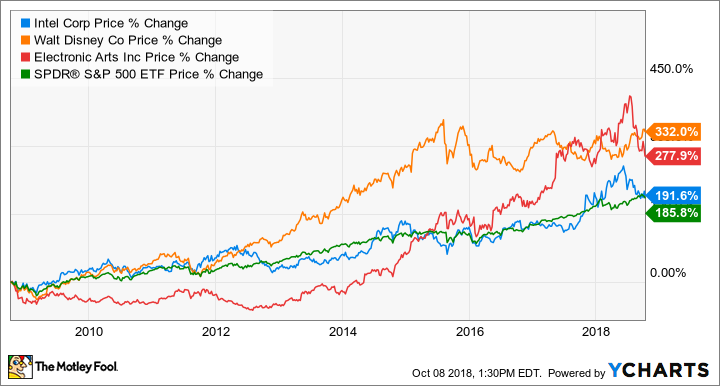 Walt Disney (NYSE:DIS), Electronic Arts (NASDAQ:EA), and Intel (NASDAQ:INTC) are three top stocks that are facing near-term headwinds but still have good growth prospects over the long haul. After moving sideways for three long years, shares of Walt Disney have been quietly drifting higher in the last few months. But the stock still trades at a compelling forward P/E of just 16 times expected earnings, a discount to the S&P 500's forward P/E of 18. It only makes sense for Disney to trade at a discount to the market averages if you believe it's a below-average company. Sure, Disney's cable channels are a mediocre business right now due to cord-cutters. The media segment is nearly half of the company's total revenue, so we can't ignore cable's weak performance. But even with the cord-cutting trend negatively affecting Disney, the company is still growing revenue and earnings thanks to its theme parks, movies, and beloved franchises. Analysts expect Disney to grow revenue 6.7% for fiscal 2018, while they expect non-GAAP earnings to improve 21.6% year over year. That growth is due to strong performance this year from Disney's theme parks and resorts segment, as well as double-digit growth from studio entertainment. Those two segments combined contribute more to the top and bottom line than the media segment. Disney's recent deal with Twenty-First Century Fox should only bolster its entertainment offering and help mitigate the struggling media segment as Disney shifts its focus to digital content and streaming. With these pieces coming together, it doesn't seem Disney will be on sale for long. Shares of video game maker Electronic Arts are down 25% over the last three months after forward guidance in its first-quarter earnings report was lower than expected. EA threw the market another curve ball when management announced they were delaying Battlefield V by a month into November of this year. But delays are routine in the video game industry and shouldn't be cause for concern. Battlefield is one of the best-selling franchises in the industry. Whether it comes out in October or November doesn't matter -- it's going to generate sales for EA well into 2019 and beyond. This new version will include a "battle royale" multiplayer game mode for the first time, which puts EA in a good position to respond to the hyper-popularity of other battle royale games like Fortnite and Playerunkown's Battlegrounds. Looking at the big picture, EA is investing in a Netflix-style cloud gaming subscription service. This service will include EA's own games as well as games created by other studios. Management believes it could be a multibillion dollar business over the long term. Additionally, EA's flagship sports franchises Madden and FIFA continue to perform well, especially on the esports scene. This looks like a classic case of the market getting caught up in short-term noise, while the drivers of long-term growth are still intact. That's why I believe this might be a particularly opportune time to pick up shares of this leading game maker. Intel shares have dipped about 14% over the last three months as the market pondered the potential consequences of the chip giant's production delay of its 10-nanometer chip and how tight chip supply in the PC market may allow competitor Advanced Micro Devices to gain market share at Intel's expense. Even though the stock is up 12% over the last year, the shares are quite cheap trading at just 11 times expected earnings for 2018. At such a low valuation, any earnings growth from here should propel the stock higher over the long term. So what's the company got going for it? For one, Intel has seen booming growth in its data-centric segment, which comprises its efforts to supply chips for data centers. It has also experienced strong demand for chips sold into the Internet of Things market, in addition to sales of Mobileye's EyeQ computer vision processor for self-driving cars. Many investors are concerned about Intel missing out on the mobile market and weak demand in the PC market, but over the long term, there should be more than enough growth in data centers and automotive to offset any weakness in PC-centric sales. Given the low P/E on the shares, you might think the company was struggling to grow, but recent performance shows that's not the case. Revenue was up 15% in the second quarter driven by 27% growth in sales to data centers. The company has kept a tight lid on operating costs which allowed non-GAAP earnings per share to soar 44% year over year. Analysts expect Intel to grow earnings 10% annually over the next five years. Given the company's momentum in its data-centric business unit, those expectations appear very achievable. And that's all the growth Intel needs to send the shares higher over the long term. Usually, the best times to buy top stocks is when market participants get wrapped up on a short-term issue that is not detrimental to the long-term growth story. Each of the three companies highlighted above face near-term headwinds in one specific aspect of their operations, but those headwinds pale in comparison to the underlying momentum these companies are experiencing overall. By staying focused on the big picture, you can take advantage of these temporary bouts of weakness and buy shares of strong companies while they are on sale to power your long-term returns.